Original EGL Report ships with item. We also include our comprehensive appraisal for identification or insurance purposes. How much will my new diamond appraise for? Laser drilling- what is it? 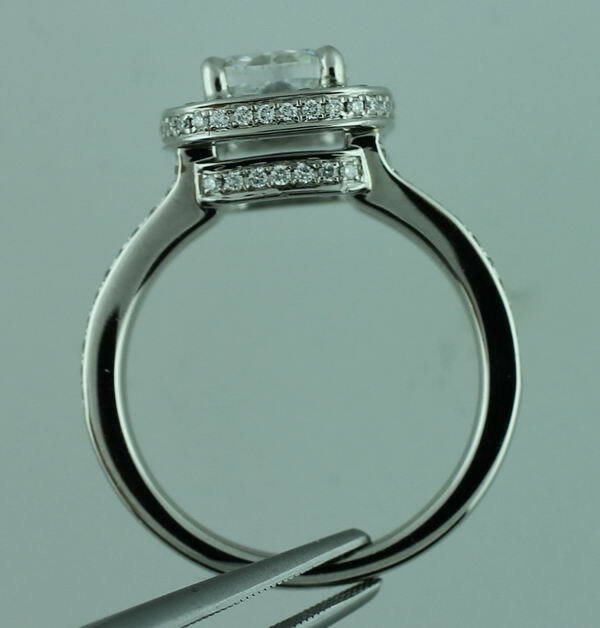 There are a number of methods of minimizing natural inclusions in diamonds. The two primary methods are "Fracture filling", and "Laser Drilling"
The first method I will describe is more intrusive and far less desirable than the second. 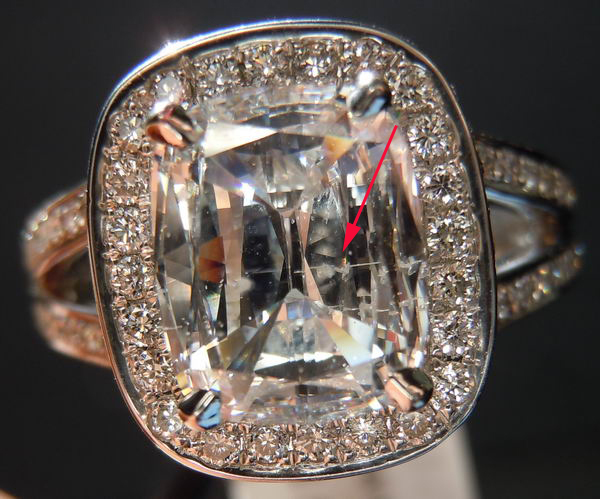 GIA will not grade a stone that is fracture filled- which is also known as "Yehuda process"
The reason it's considered worse is that it involves injecting plastic in a fissure in a diamond. It's similar to a process used on car windshields- where they repair a crack. 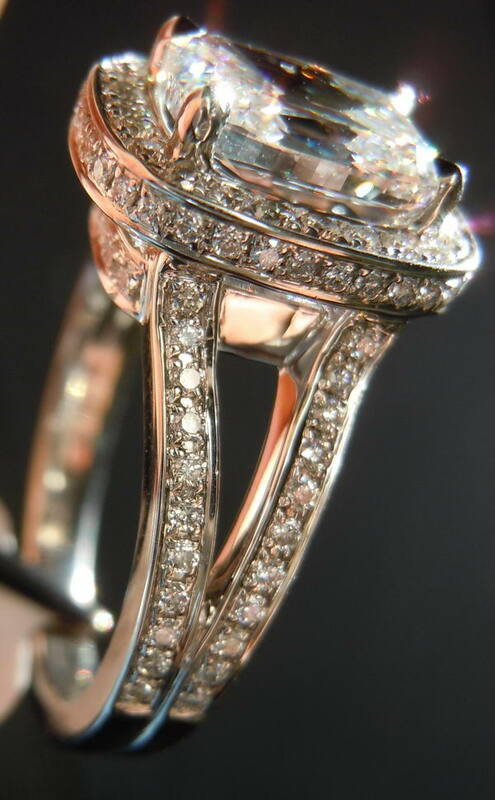 In diamonds, the process results in a slightly hazy appearance- and sometimes a rainbow effect can be seen. Another problem with it is that it's not necessarily permanent. For example if the stone is heated as is common during jewelry manufacture or repair, the plastic can melt causing the stone to return to it's former condition. 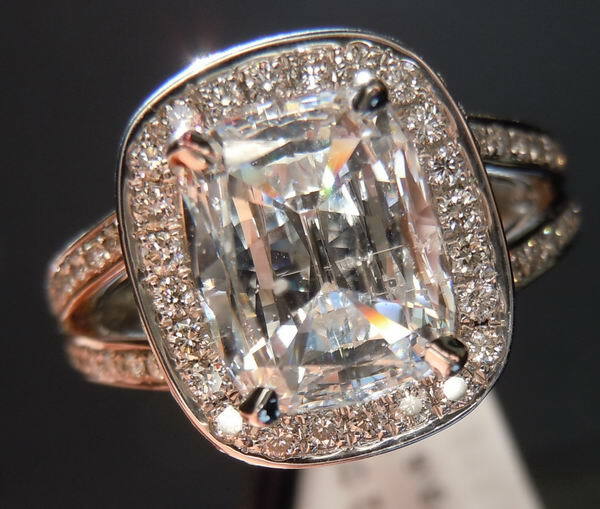 Bring your eye clean diamond in a ring to be sized- and get back a stone with a horrible feather imperfection- bummer, right? Laser drilling is a process used on diamonds that may have an obvious black carbon spot. A laser is used to drill a channel to the carbon, then the diamond is boiled in sulphuric acid which bleaches the black spot into a white one. GIA will grade such diamonds, and indicate the drill on the report. Another positive aspect to this process is that it's fairly easy to spot, sometimes with a loupe, sometimes naked eye. This is a good thing compared to Yehuda filling which can sometimes be difficult to spot. The idea is that honest people in the trade do not support selling of treated stones going undisclosed. 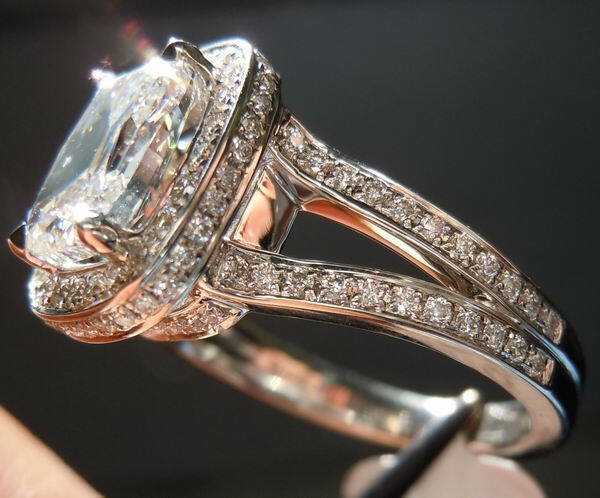 We never carry fracture filled diamonds- and I can not recall another laser drilled diamond we have stocked. 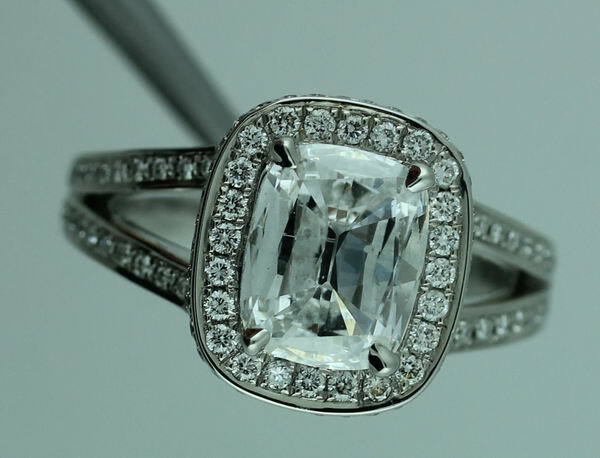 This is a stone which who's value and appearance is so incredible we decided to offer it. In the shot below I've pointed out the channel created by the laser. It might be possible to see either the tiny white spot ( used to be black) or the channel in person- however it's by no means obvious. What do I love so much about this stone? First of all the color- blindingly white. Second of all the cut. It's a great example of a Daussi Cushion. If you told me it was 2.75cts I would not have doubted that based on it's huge appearance. The best Daussi cushions have a glittery, icy appearance. This is a prime example. That's another aspect that drew me to the stone- the way it's set. It's incredibly substantial, and comfortable to wear ( I'm told by our hand model). The manufacture is flawless. Platinum. Yes.